I am excited about this post because I am cooking one of my most favorite foods in the entire world -- eggplant. My friend and I ventured to farmers market in Westwood on Thursday. It is located near the UCLA campus, so it's typically pretty busy. As soon as we arrived, there was a vendor with tons of bags of 3-4 pieces of eggplant for $3! I didn't think twice and immediately picked one up. I also grabbed some freshly made eggplant hummus from one of the vendors -- and also a bag of fresh basil for $1. I remembered I needed some fruit for the house, so I grabbed a couple green and purple plums and a few apples. They are all so fresh and delicious this season. So, in case you couldn't guess - I will be posting today about cooking eggplant! 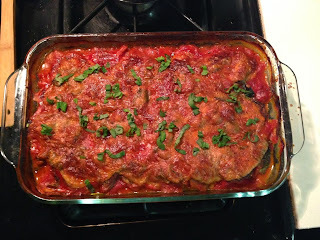 I don't have any particular recipes for eggplant parm or eggplant lasagna, but I prefer tons of layers of eggplant with sauce and basil and cheese -- whatever you want to call it, works for me. Here are the veggies and sauces I am starting with, followed by a few cooking steps and tips. 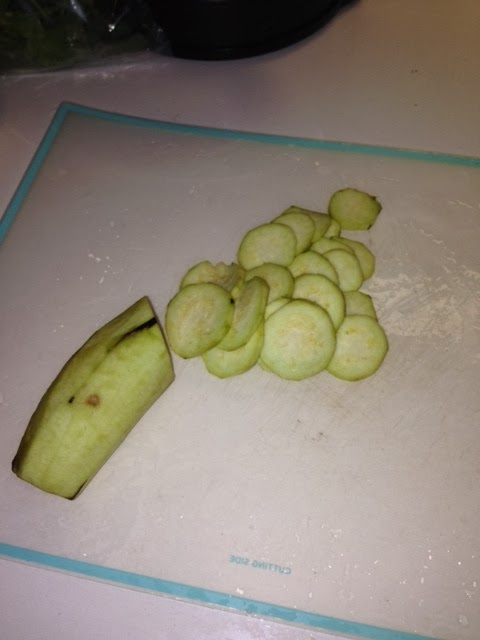 I start out with peeling, slicing and salting the eggplant slices and leave them sitting for at least an hour or two. 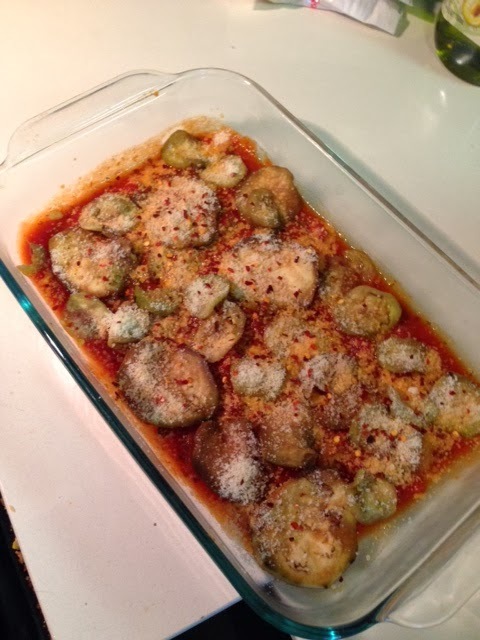 The purpose of the salt on the eggplant is to draw out the moisture -- it makes for less chewy eggplant. You also want to slice it really thin. After you salt the slices and draw out the moisture, either ring them out or pat them down with several paper towels. They should be real wet. Here are a few pics of the slicing and salting process. I then move on to my marina sauce -- and I use both canned or jarred sauce and diced tomatoes. 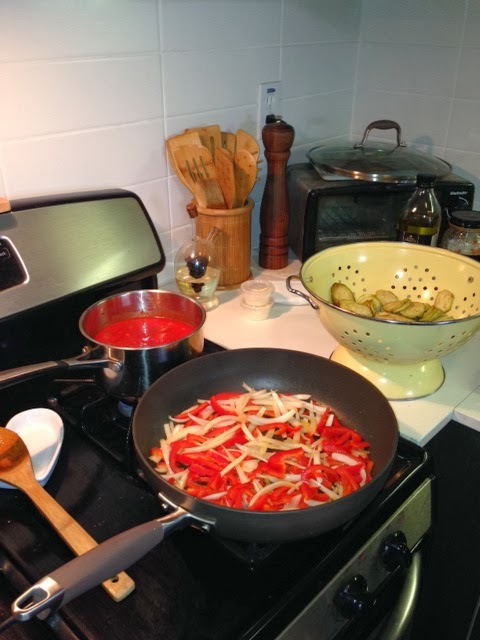 I then sauté peppers and onions (similar to my "olive oil, garlic and wine" page) and when they are softened, I add them to the sauce. 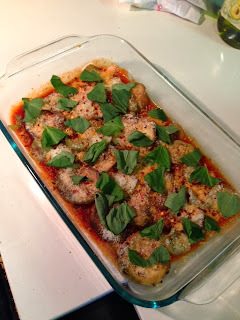 I then top it off with a ton of fresh basil and fresh ground pepper. 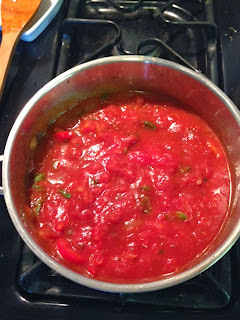 I let the sauce simmer for at least two hours. Typically, I move on to something else around the house since I have a little bit of a wait. 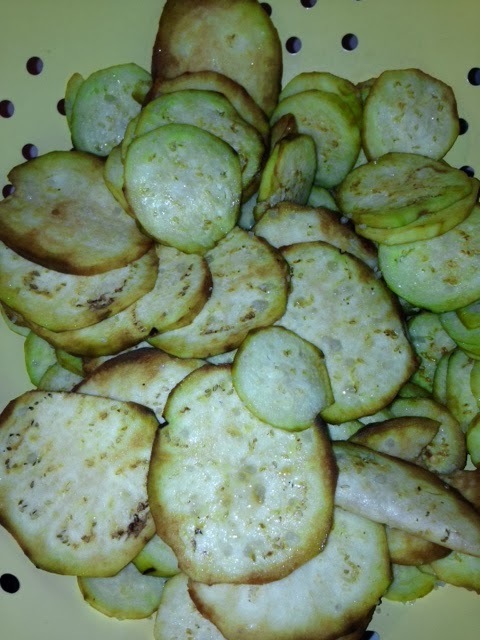 After a few hours -- and after ringing out the eggplant, this is what it looks like. 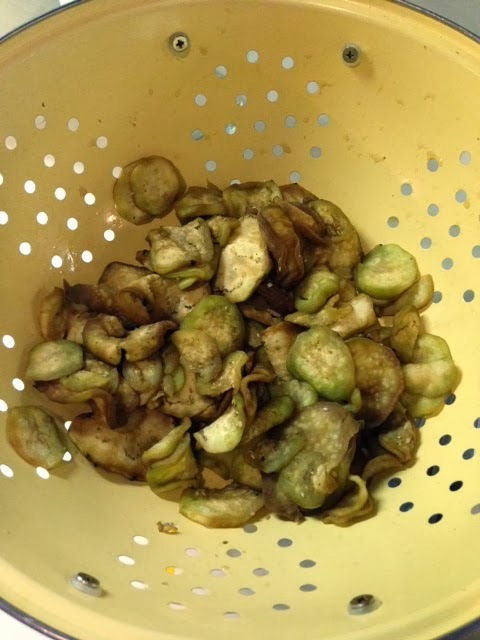 It doesn't look super appealing, but you will be thankful you did all this once you sit down to eat it. After a few hours, it is finally time to begin the layering process. 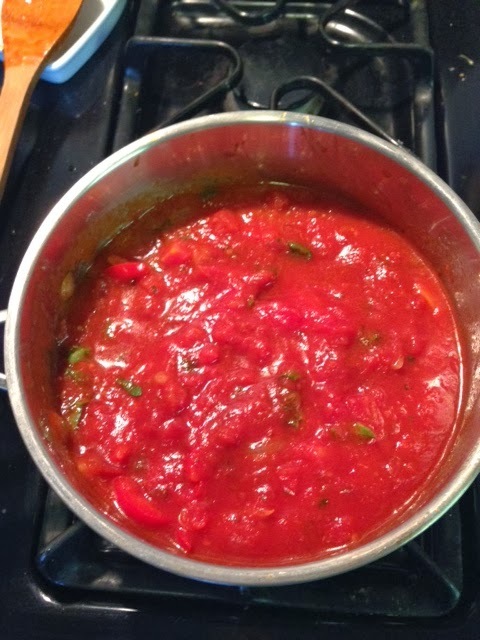 I start out with a drizzle of EVOO and a generous spread of marina sauce to coat the bottom of the dish. We don't want anything to burn or get stuck to the bottom of the dish. I then add the eggplant, some parmesan cheese, crushed red pepper, fresh ground pepper and more basil. This is all "layer number one". 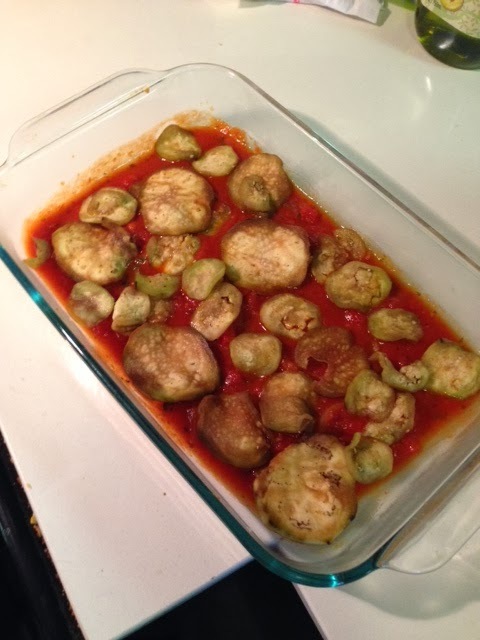 I make sure the eggplant is flat so it cooks evenly. After you do layer number one, REPEAT. I continued these layers about 3 and 1/2 times...until I ran out of sauce. 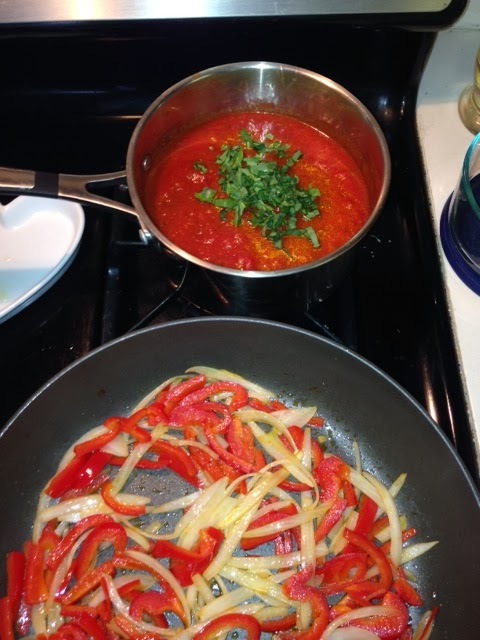 I topped it with some provolone cheese -- because that's all I had. 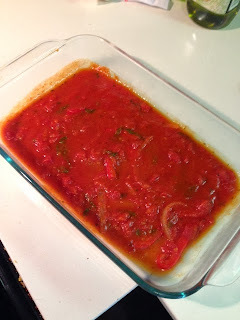 You can also throw in some ricotta in between slices, or mozzarella....but we opted for a lighter version. 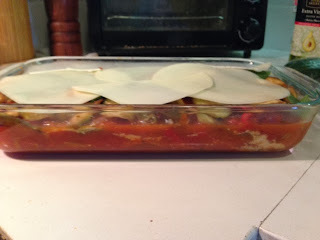 I preheated the oven to 375 degrees and once it was ready, I cooked the eggplant lasagna for about 45 minutes to an hour. 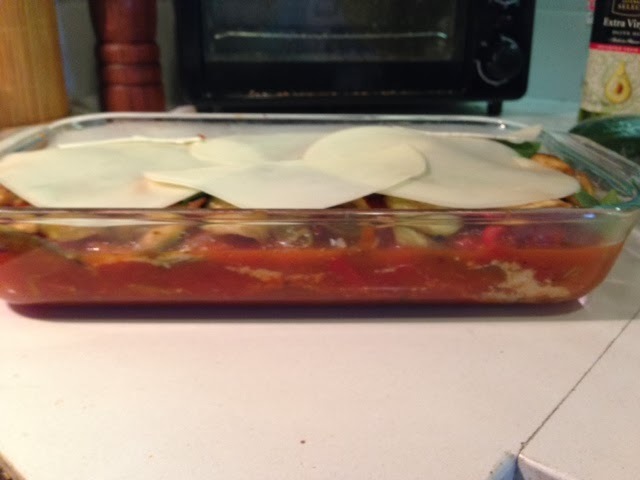 Feel free to cover it so the cheese doesn't burn -- depends on your oven. It is imperative you let it sit for at least 30 minutes before slicing into it because of all the juices. You want all the flavors to absorb. And honestly, it will probably be even better tomorrow night! 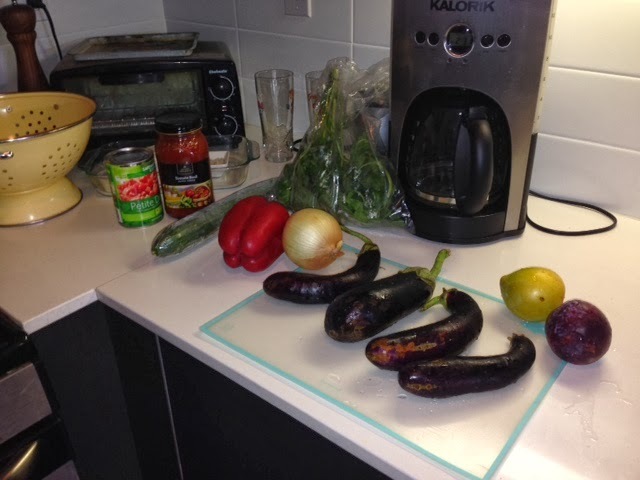 We will be having just the eggplant as the main dish, but feel free to cook up some whole wheat pasta and/or some meatballs to have on the side. Super yummy dinner while watching the Red Sox in Game 4!!!! GO SOX! 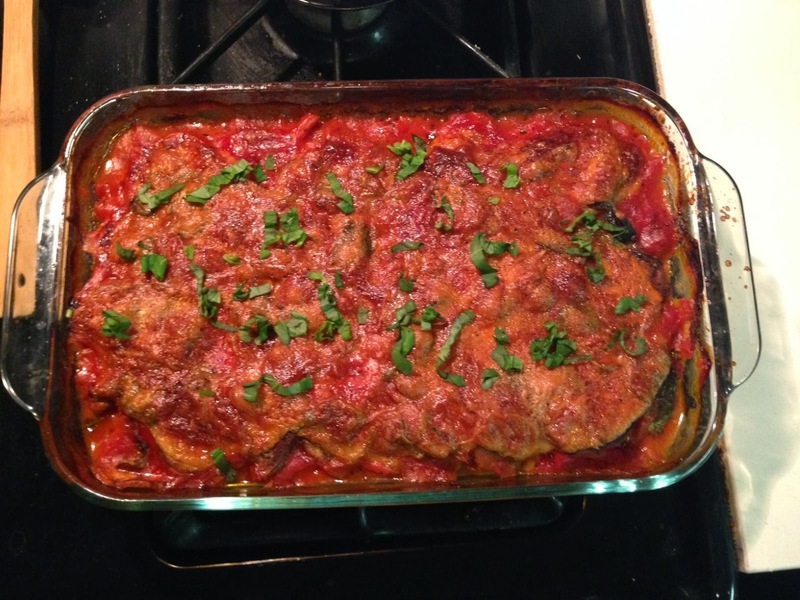 I'd never had eggplant until last winter and now its one of my favorites! I make it all the time! :) And I looove LPQ, everything there is so good! Have fun with Chrissy this week! !